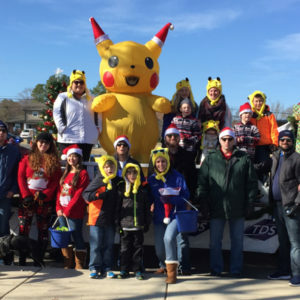 A large group of employees worked together building TDS’ float for the annual Mt. Juliet Christmas parade, of which TDS is also a major sponsor (photo above). In line with the city’s chosen Pokémon theme, Pikachu (a.k.a. Mike J., Field Service Technician) rode along on TDS’ float. The float featured holiday lights all around, a fully lit Christmas tree with presents, and the movie Frozen running on the TV (with fully operational sound system). 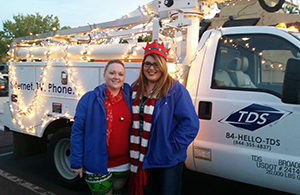 A group of employees in Mesquite participated in the annual Parade of Lights, which TDS sponsored. As part of its sponsorship, TDS also donated 25 pounds of canned foods to the Virgin Valley Food Bank and the Salvation Army. Employees in Monticello participated in the local holiday food drive. At our sister company, OneNeck IT Solutions in Eden Prairie, employees also collected food—151 pounds, in fact, for the ICA Food Shelf. They also hosted a toy drive for Toys For Tots. 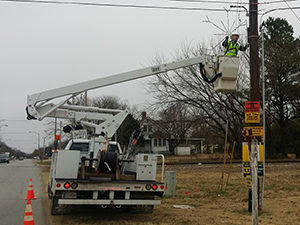 TDS helped put up the Christmas lights in Kellyville; shout-out to Field Service Technician Jason H. for hanging the lights. Employees delivered wrapped gifts to Porchlight, a Madison-based non-profit dedicated to helping the homeless. Employees volunteered to help families in need and hand-selected and wrapped presents that will be delivered to dozens of families and 50+ individuals who would have otherwise gone without. Employees also collected hundreds of toys for Toys for Tots, including a 1993 Bo Jackson baseball card and figurine, along with other baseball collectibles, stuffed animals, Barbie’s, Legos, puzzles and so many more — donated for the kids in need to enjoy! But employee generosity didn’t stop there. Second Harvest Foodbank was presented a check for 15,000 meals. On behalf of all employees, Vicki Villacrez, CFO and VP of Finance, presented the check live on the 6 p.m. NBC 15 Share Your Holidays newscast. 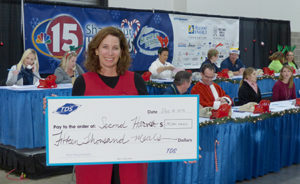 The donation was a culmination of a food drive at the TDS offices in Dane County, a phone system donation for the annual Share Your Holidays telethon, and because Second Harvest was selected as the charity of choice by an employee vote. On behalf of all of us at TDS, thank you for letting us to be part of your community!